I found this in a free box a long time ago. It's a corporate published history of Brink's, well-researched, parochial and totally biased. As a fan of the heist genre, I thought this would have some good information and be entertaining as well. I wasn't disappointed. The first half in particular, talking about the early days of Brink's moving money in the early West via horse carriage (real cowboy stuff) and it's growth into the twentieth century was good. The second half was a bit duller, but I still enjoy some of the corporate history. Also found at my parent's, had to offset the Gilbert murder mystery with a Gilbert thriller. The reveal of the antagonist in this one was much weirder and colourful than I had remembered. Made it a bit uneven, but a really cool portrayal of rural Italy and the art/archaeology world. This is the spark that fuels my Ambler/Gilbert fire that was the first half of 2015. I am always in the mood for a good British murder mystery when I am staying at my parent's for the holidays and found this classic in the shelf. Reading it at this age, I get all the cultural subtleties and manners, so the book seemed less subtle than when I was a younger man. Still, thoroughly enjoyable. Uncommon Danger is in the 4-volume Eric Ambler omnibus, but the copy I read I found in my parent's guest bedroom bookshelf, a really old paperback with a breaking spine and flaking corners. I read it anyways. It was great, though I preferred the setup (with the down and out journalist on his last dime crossing a frontier with unknown contraband) then the conclusion. Still, great stuff. I can not remember the context of when I was reading this, but I thoroughly enjoyed it. My aunt pointed out that it was really a satire, subtly ridiculing most of the characters. Good. Okay, now back to full manliness! I've never read this classic and only seen snippets of the movie (which I shall also rectify now that I have read the book). 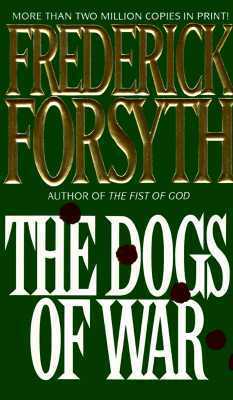 As a young man, I read a book of short stories, No Comebacks, by Forsyth that I absolutely loved, then tried to read The Day of the Jackal and wasn't able to finish it. I think that sort of put me off Forsyth for a while. I found The Dogs of War at the local thrifts shop for two bucks in a thick, generick 90s paperback that I didn't have to worry about treating roughly and jumped right in. Really, this should be called The Dogs of Preparing for War. The premise is a massive British mineral company discovers a mountain of platinum in a fictional West African backwater country and their CEO hires a mercenary team to take the entire government out while also performing some financial shenanigans to ensure a massive killing on the market. The mercenary he hires, Shannon, is the protagonist and he is tasked with first scouting the mission, coming up with a plan, hiring the team and supplying it. This process is really the majority of the book, a 260-page chapter called The Hundred Days where Shannon and his men travel all over Europe buying weapons and equipment, arranging transport, negotiating with customs brokers, gathering sketchy documentation, dealing with rival mercs and all the rest of the work that goes on in preparation of a military coup. The only action is the aforementioned rival merc and that is a brief shot in the arm in what is otherwise all procedural. For me, it wasn't boring at all. I couldn't put it down. I love this stuff anyhow, but it being pre-internet made it even more fascinating to read about the way arms get bought and sold and how to avoid surveillance (lot of letters to people staying at hotels under false names) and other extra-legal activities in 1970s Europe. The portrayal of Africa and the Africans is at best patronizingly colonial and at worst straight-up racist. This book was written right after the wave of African independence from Colonialism and the attitude is one of the post-colonial country's superiority, with a contemptuous portrayal of the African governments as being hopelessly corrupt and inefficient. This portrayal is not untrue, but when the root causes are unexamined (i.e. colonialism itself), it comes off as pretty ignorant at times. The context is overall very cynical and morally speaking the whites in power, especially the businessmen are portrayed as being utterly unethical. It's in the competence where the racism is the worst. It really gets bad when Forsyth talks about the Africans as soldiers, suggesting that they have an innate tendency to shoot with their eyes closed. I'm sure Forsyth is reflecting the attitudes of old Africa hands of the time, but still. It's not just racist, it's also historically inaccurate and weakens the rich, realistic detail he builds up so well otherwise. It's ironic, because at the end of the book, it's clear that despite his militarism and accepted colonial attitude, Forsyth seems relatively liberal at the end of the book. I won't give anything away, but "good" Africans come out of the woodwork plot-wise at the end and it's clear that Forsyth is in favour of them ruling their own lands. Despite my misgivings on the portrayal of the Africans, this is a great read and deserves its reputation as a classic. Which book blogger has read and posted about women authors in four of his last six reads? This guy! Okay, that was bad, but I do give myself a small pat on the back for trying to expand my horizon out of my cozy nerdy boys' club of masculine genre fiction and succeeding somewhat (by reading cozy nerdy feminine genre fiction). Tales of Earthsea is 5 longish stories that fill out either the history or some parts of the world set out in the original trilogy. I didn't make an effort to place these stories into the overall context of that trilogy, since I had forgotten all those details, but as I read them, bits and pieces came back to me. The stories here are nice because most of them are very local, going into characters and locations with the richness that LeGuin is good at and avoiding the more fable-like remote telling that made the third book in the trilogy, The Farthest Shore, unsatisfying for me. There is also a history at the end, which I think the attuned reader would find invaluable. An enjoyable read, but it was the forward that I found the most stimulating. 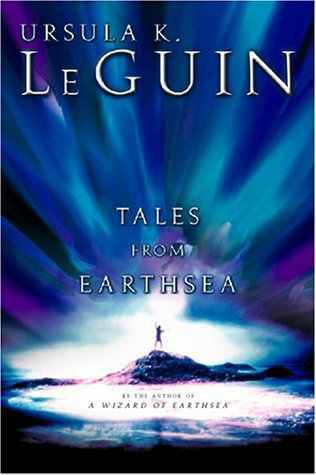 As is my practice, I went back and read it after I had finished the book and it is there that I was reminded of LeGuin's genius, not just as a fictional writer, but also as a very active and critical social thinker. This little essay just rips apart the commodification of science fiction and fantasy. She goes after the world of completists, collectors and the producers who churn stuff out because it satisfies a certain consumer need. Her attacks are broad and structural, but I almost suspect that George Martin might have been one of the producers she had in mind here. So people turn to fantasy for stability, ancient truths, immutable simplicities. And the mills of capitalism provide them. Supply meets demand. Fantasy becomes a commodity; an industry. Commodified fantasy takes no risks; it invents nothing, but imitates and trivializes. It proceeds by depriving the old stories of their intellectual and ethical complexity, turning their action to violence their actors to dolls, and their truth-telling to sentimental platitude. Heroes brandish their swords, lasers, wands as mechanically as combine harvesters, reaping profits. Profoundly disturbing moral choices are sanitized, made cute, made safe. The passionately conceived ideas of the great story-tellers are copied, stereotyped, reduced to toys, molded in bright-colored plastic, advertised, sold, broken, junked, replaceable and interchangeable.